The moon, though a satellite of our planet, is in the field of Indian astrology considered as one of the nine planets. This is so because the moon or Chandra as this planet is known in Hindi is said to influence the mind more than any other heavenly body. Traditional Indian horoscopes are calculated according to the moon sign. The Hindu lunar Calendar is the most followed calendar in India and is used to calculate various religious occasions and festivals. 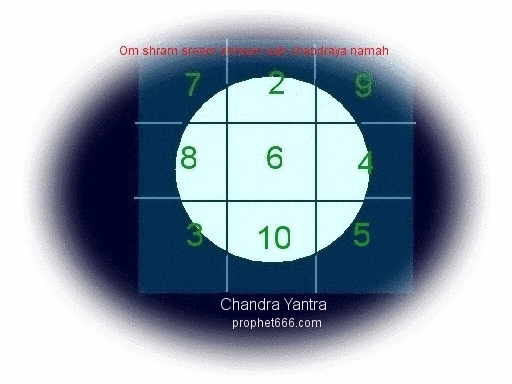 This is a Yantra which vibrates to the numerological frequency of the moon, which is the number 18. Do I have to directly put in the yantra in a locket? Must the appearance be same as the image? And are there steps that I should follow?